Take your on-court game to the next level and take complete control of the game's proceedings when you lace up in a pair of Mercurial SuperflyX VI Kids Academy GS TF Football Trainers from Nike in Total Orange, Black, Total Orange and Volt. 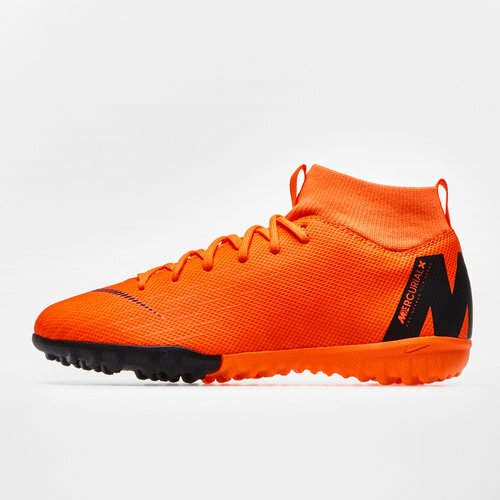 These Nike trainers form part of the FAST AF pack which features a collection of stylish and impressive boots and trainers, these Mercurials, in particular, have been designed for matches on synthetic surfaces. The rubber outsole is non-marking and gives the wearer aggressive traction for all these darting runs, changes of direction and movement around the field. Overall the shoe fits close to the foot, the second skin fit forms another layer around the foot which ensures natural touch on the ball. The flexible design keeps the foot unrestricted, enabling natural movement and better performances.